Kits are sold out - Very nice Reproduction Cotton fabric. Shows little nursery rhyme children playing along with the Three Blind Mice and many others. Apron fabric is a sweet Libery of London cotton lawn. White Imperial broadcloth for collar. 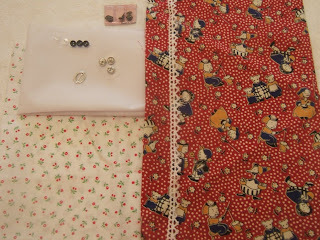 5 Snaps, 5 buttons, cute belt buckle and cotton lace for apron.